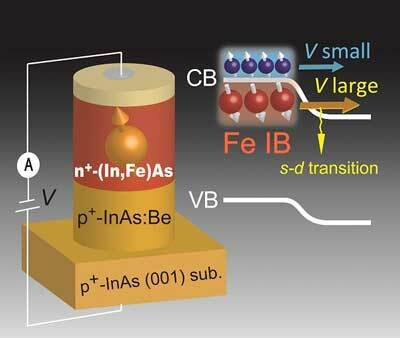 (Nanowerk News) Researchers at the University of Tokyo and the Tokyo Institute of Technology have successfully fabricated a spin Esaki diode composed of an n-type ferromagnetic semiconductor (FMS) indium iron arsenide (In,Fe)As—a hybrid material made by doping iron (Fe) into indium arsenide (InAs), a III-V semiconductor well-known for high-speed device applications—and p-type indium arsenide (Applied Physics Letters, "Electrical tuning of the band alignment and magnetoconductance in an n-type ferromagnetic semiconductor (In,Fe)As-based spin-Esaki diode"). In the Esaki diode, a type of semiconductor utilizing what is known as the tunnel effect, its magnetoconductance—the current change when an external magnetic field is applied—can be widely tuned, both in sign and magnitude, by the bias voltage, or the direct-current voltage applied for establishing optimal operation. This result highlights the novelty of integrating a spin degree of freedom into conventional semiconductor devices. The research group of Research Associate Le Duc Anh and Professor Masaaki Tanaka at the Graduate School of Engineering, the University of Tokyo, in collaboration with Associate Professor Pham Nam Hai at the Tokyo Institute of Technology, used iron as the magnetic element in an indium arsenide-based Esaki diode structure. The iron atoms doped in III-V semiconductors such as indium arsenide are in an isoelectronic state, meaning they do not supply carriers, allowing the researchers to independently control the localized spins (iron) and carriers. Iron electronic states form an impurity band that exists separately and below the energy levels of conducting carriers, known as the conduction band, and these two bands (impurity band and conduction band) have highly contrasting symmetry and spin polarization. The impurity-band properties therefore are hardly represented in the transport properties of indium iron arsenide thin films. The special feature of the indium iron arsenide-based spin Esaki diode in this study is that the electrons participating in the current can be switched between the impurity and conduction bands using different bias voltages; by doing so, the sign and magnitude of the magnetoconductance can be flipped. On the other hand, the researchers obtained important information on the spin-dependent band structure of the diode’s components from the bias voltage dependence of the magnetoconductance, thereby providing an effective tool for studying the electronic structure of spintronic materials. The present results on the indium iron arsenide-based spin Esaki diode promise to accelerate the discovery of other novel materials and lead towards the realization of practical spintronic devices. "Despite the wealth of research on ferromagnetic semiconductors actively carried out by many groups around the world since the 1990s, realizing ferromagnetic semiconductor-based devices still faces serious problems," says Tanaka. He continues, "One of the key challenges is elucidating their spin-dependent band structure. Our results on the spin Esaki diode in this study not only suggest a very effective approach to this important issue, but also vividly demonstrate that by utilizing their intriguing spin-dependent band structure, it is possible to control the sign and magnitude of the current's response to a magnetic field. Thus, this is an important step towards exploring and understanding new materials and their device applications." Anh, who has carried out most of the experiments, says, "Compared with other spintronic materials, iron-doped ferromagnetic semiconductors are relatively new; therefore, they have many unexplored properties, but also have shown many unprecedented important features. In our current work, we demonstrated for the first time such a new feature in a new spin device, the spin Esaki diode, containing an n-type ferromagnetic semiconductor. I am very pleased with this result." He continues, "I hope to further deepen our understanding of the materials and bring them to a new stage of practical device applications in the near future."